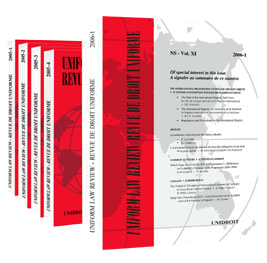 Uniform Law Review / Revue de droit uniforme has been appearing as a new series since 1996. It constitutes a comprehensive source of information on uniform law for all those involved in international private commercial law. This bilingual (English/French) quarterly publication – some 1000 pages a year – closely follows the legal doctrine, monitors the work of international organisations, assesses the soft law option in the legal harmonisation process and reports on the application of uniform law instruments. Uniform Law Review / Revue de droit uniforme is published by the International Institute for the Unification of Private Law – UNIDROIT - whose achievements and ongoing work receive extensive coverage in the journal. In particular: the 1995 Rome Convention on Stolen or Illegally Exported Cultural Objects, the UNIDROIT Principles of International Commercial Contracts, Principles of transnational civil procedure, and work on instruments to facilitate financing in international trade: the acquisition of high value equipment (the 2001 Cape Town Convention and its Aircraft Protocol) and, in the field of financial and capital markets law, the harmonisation of substantive rules applicable to securities held with an intermediary.